Plant Environment: Prefers a full sun location and must have well drained soil. Plant Bloom: One of the earliest blooming cherries. Single rose pink blooms appear in March. 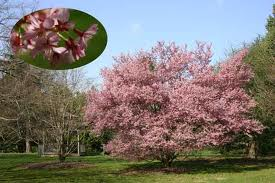 A moderately fast growing ornamental tree that makes a nice vertical accent in the landscape. This variety casts light shade which allows for grass to survive in it’s shadow. Beautiful shiny maroon bark adds winter seasonal interest in the landscape.